In this DIY how to guide you will learn all about fixing vertical blinds including information on fixing venetian blinds and fixing roman blinds. The principles of fixing a blind, whether it is fixed to the face of a window recess or fixed within the window recess itself are pretty much the same for all types of blinds. One of the most important parts when fitting a blind is to get it level and central with the window, which in some cases can be tricky but we will show you how to do this with ease. 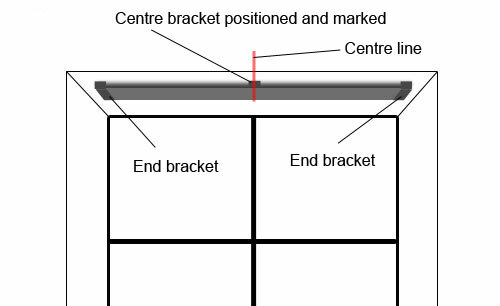 You will also find out about how to mark and fix your brackets on the wall, how to accurately measure for the size of blind you need, about the different types of fixing brackets available and how to both face fix a blind over a window or head fix a blind within a window recess. Fitting and fixing Venetian blinds, Roman blinds and Vertical blinds all follow the same routine (pretty much). 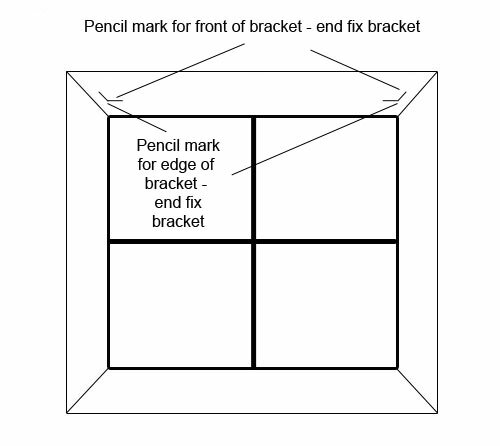 It normally involves fixing a bracket or brackets (or the entire carriage) to either the internal area of the window recess (top fix or recess fix) or above the top of the window (face fix). The blind itself or its mechanism is then housed in a box called a blind carriage. 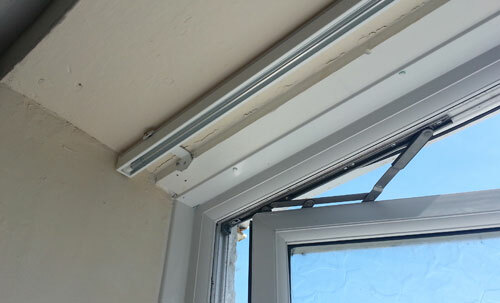 The carriage (if it hasn’t been fixed directly to the wall) is then fixed into the brackets and your blind is then already to go. In most cases, the carriage will be secured within brackets and these brackets themselves will be fixed to the wall. Depending on the type of blind you are fixing will really depend on what brackets are used. Even a single type of blind (e.g. Roman blind) could potentially have several different types of bracket, depending on who has manufactured it. 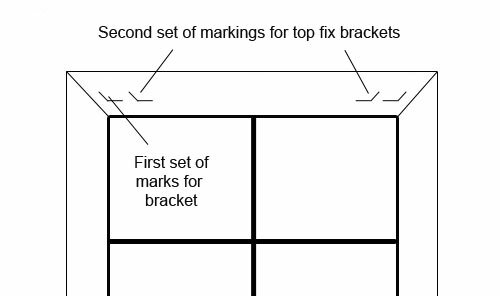 To these ends we will explain below the general methods of fixing the brackets as, in pretty much all cases, this will be the same. Blinds can be fitted in two ways, either on the face of the wall above your window opening, called "face fixing" or up onto the soffit or head of your window opening. This is called a recess or a head fitting. Before you actually fix it in place, you will need to make sure that it is indeed the correct size. 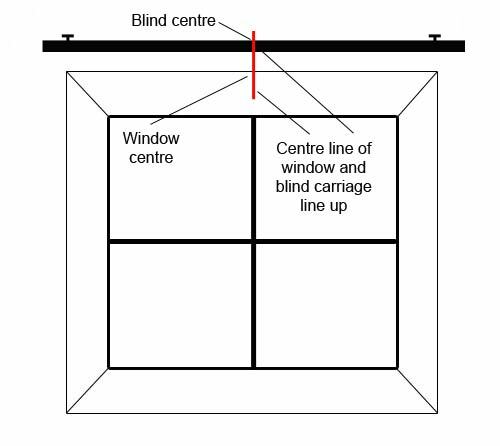 For a face fitting, using the diagram above, the centre of your blind carriage should be in the centre of your window opening. This means that any overhang, demonstrated by the figures B should be the same. One thing to be aware of is that it is a good idea to have a bit of an overlap between the blind and the wall, so that the blind runs over the wall by at least 8cm. This way, once closed, it should block a fair bit of light also, but if you are not interested in achieving this, ensure the blind is the correct width for your needs. It is also worthy to note that once you have found the centre you will have to decide how high above the top of the window recess you fix your blind. Again, make sure it goes up at least 8-10cms if your goal is to block light. 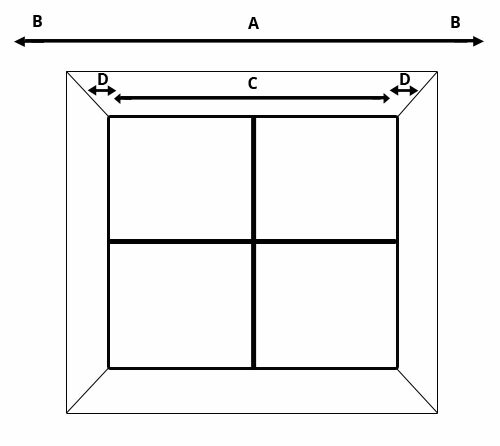 For a recess fixing, the gap either side of your blind (figures D) should be the same. Again, depending on the type of blind you are fixing and the brackets included with it, may dictate where they are fixed. In the majority of cases, brackets will be fixed to the head of the window recess, but we have seen some that need fixing to the sides of the recess. With these types, once fixed in position, they will provide more than enough fixing strength but the problems comes in actually fixing them in place and getting them level, not to mention, ensuring that the blind itself or carriage are the exact width required! If you have these types of fixings, just be aware of the need for accurately measuring the width of blind you need. As with the above, if your main aim is to block light from the window then you will need your blind to run the full width within or over the recess so that it blocks as much light as possible. All blinds are fairly easy to fit but require accurate measurement at the start to make sure you have the correct size of blind and it is positioned in the correct place in the window reveal or over the window itself. 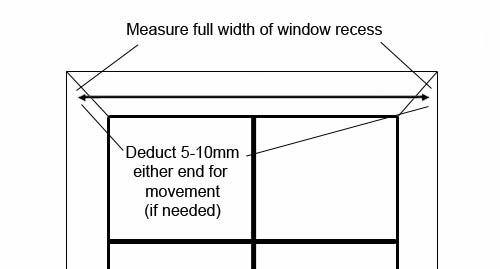 Your chosen method of fixing (outlined above) will pretty much dictate how you measure your blind in terms of whether it needs to fit to the exact recess or whether you are face fixing so can be a little more flexible with your measurements. One final point to be aware of when measuring is that both the carriage and the edges of the blind should be equal in width. 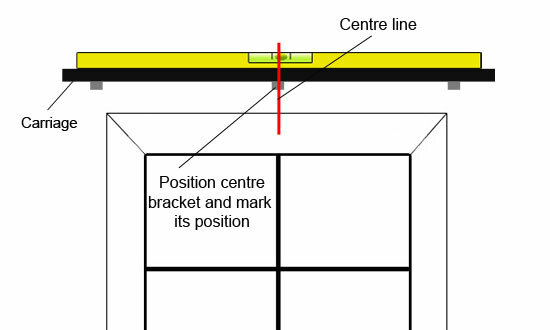 If the sections that actually make up the blind extend beyond the carriage you will have to take this into account when measuring, especially if you are head fixing as if they are too close to the faces of the wall they may not open or close correctly. 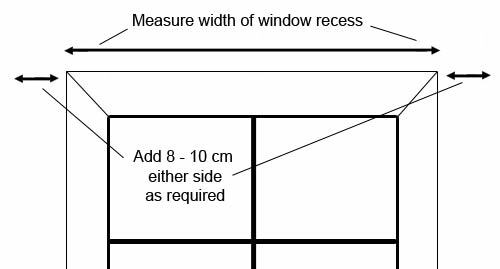 Additionally, always measure your window in three places – top, middle and bottom, from the top to the bottom of the recess and also in three places (left, middle and right) for the width. 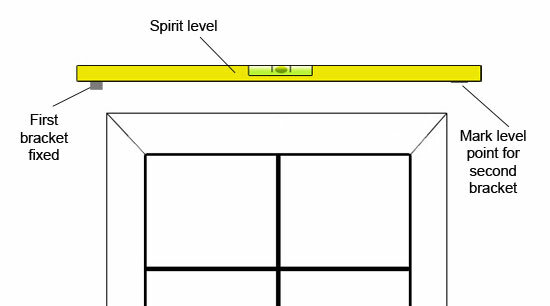 Although your window or even door recesses looks square it might not be so by measuring you will be able to tell this. If it’s not and you are going to head fix, use the smallest width measurement for the width and the longest height measurement for height. Which ever fixing path you have chosen you will need to make sure the blind is central once in place. This is really more of an aesthetic thing, although if your aim is to block visibility, if the blind is too far to the left or right then it may not end up covering parts of the window and also any moving parts may be too close to the walls surface to allow them to work properly. To guarantee that the blind will be central, the easiest way is to measure the size of the window opening and mark the centre with a pencil. Then measure the length of the blind carriage and place a mark on that. You can use this method for both types of fixings e.g. face fixing or recess. 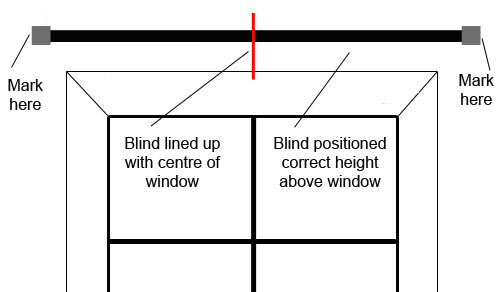 When the blind is fitted the two marks should line up meaning you have the centre of the blind in the centre of the window. When you are 100% sure about the position of your blind carriage, the next job is to fit the brackets that hold the carriage in position, unless the blind requires the whole carriage fixing to the wall. 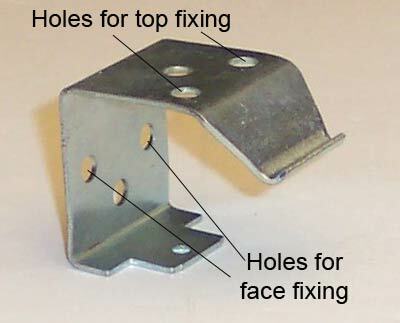 As we have established, there are numerous different types of bracket for different makes of blind but in most case the bracket is fixed to the surface using the normal fixing technique of drilling a hole, adding wall plugs and then screwing the bracket up. The carriage then clips in or slots into each bracket. There should be at least two (sometimes three) brackets with your blind. If you have two, then each should be fixed near either end and if there are three, one at each end and one in the middle to distribute the weight of the blind evenly between them. If you are fixing the entire carriage to the wall, then in most cases there will be three fixing points inside the track of the carriage, again at opposing ends and then one in the middle. With the brackets fixed, again, fix the carriage into them to check that it is centrally aligned with the window and level (place your spirit level on top of the carriage to check this). 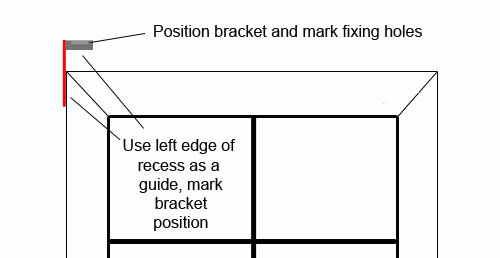 If you find that you are not central or level, work back through the steps above to re-position the brackets as needed or if it’s not too bad, you may decide to just live with it! 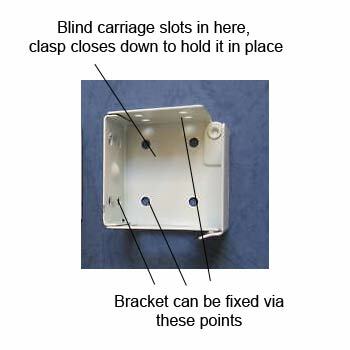 You are almost there – for one last time, fix the carriage back into the brackets and (if needed) fix the actual blind section(s) onto the carriage (following manufacturers instructions – more mentioned below) and then check it all works as it should do. If not, check back through the manufacturers instruction for the blind, but if so, stand back and admire your handy work! Once you have your brackets and carriage in place you may now need to fix up the actual blind sections (or vanes as they are also known) to complete the job. 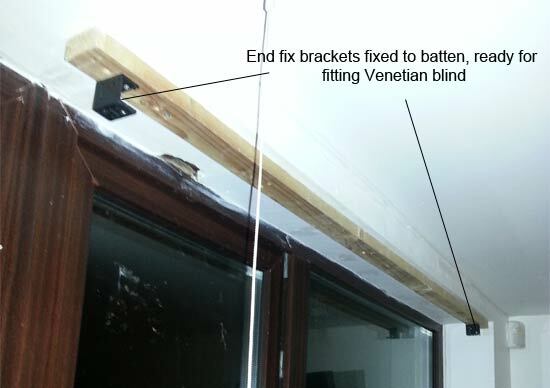 If you have a Venetian blind then in almost 100% of cases the vanes and the carriage will come in one complete set, so once you have fixed to the brackets you are all done! However, if you have a Roman or Vertical blind you will probably still have a bit more to do. In most case both of these blinds will come with the vanes detached so you need to fix these in place. 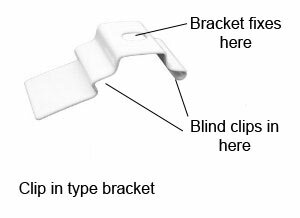 Due to the variety of fixing methods between manufacturers we cannot advise exactly on how to do this but in most cases it will involve clipping each vane (in the case of vertical blinds) on to each clip on the carriage or clipping up the blind material and inserting the dividers in the case of a Roman blind. For which ever blind you have, refer to the manufacturers full instructions on how to fit the vanes and complete the job. Once all fitted, give it a test to make sure it all works correctly. Fitting Roman, Vertical and Venetian blinds is a fairly easy job in principle but getting all the brackets in the correct place and making sure very thing is level can soon turn complicated. For more help and advice you can watch several videos on how to fit various types of blind in the home in our video section on fitting different types of blind or you can check out the video below. Sturdy shelving and workbench kit! What Type Of Plasterboard Fixings Should I Use To Fit Ventian Or Vertical Blinds? Can I Fix Roman, Ventian Or Vertical Blinds In My Timber Conservatory?